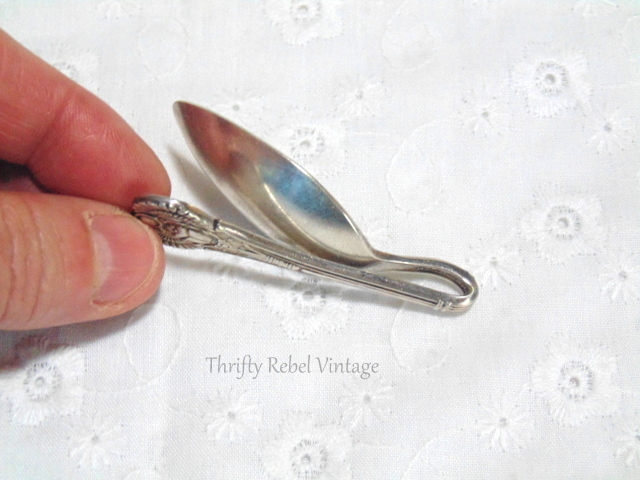 Making a spoon pendant doesn’t have to be difficult. The version I’m sharing today is quick and easy… with no drilling or cutting required. 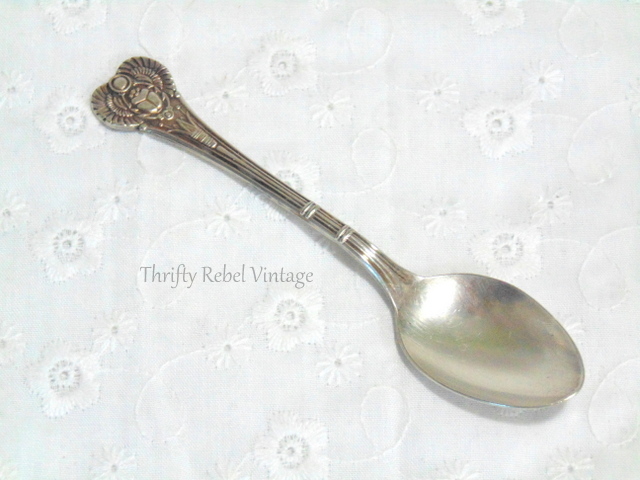 I have a large stash of vintage silver plate spoons in all sizes. Around here I find them mostly at thrift stores and garage sales. For this project I’m using a small one… it’s just 4 1/2″ long, but you can use any size really. It just depends on the size of pendant you want to make, and what you have to decorate it with. Once you’ve got a spoon go ahead and bend it… like this. You can measure if you like, but I just wing it. This will probably leave a gap, as shown above, that will have to be closed… unless you’re way stronger than I am and you can close it all the way. But if, like me, you need a little assistance just grab some needle nose or regular pliers. 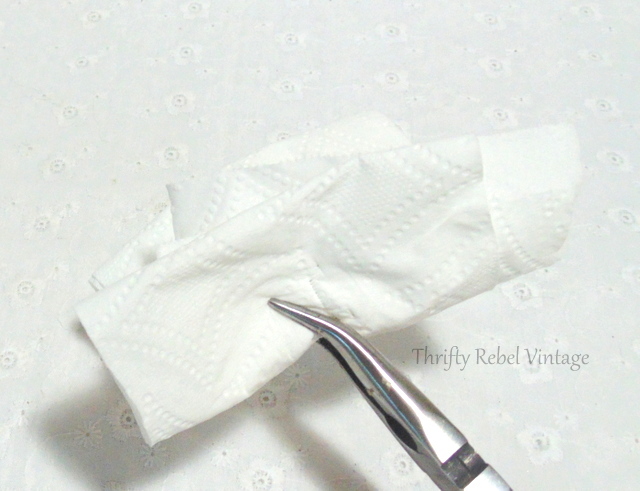 Wrap the spoon with a paper towel or a rag, whatever you have on hand so it doesn’t get marked up, and squeeze the top area to close up the gap. Now it won’t fall off the chain. Then, using E6000 glue, add whatever bling or doodads you have to dress itup. I chose a vintage rhinestone heart earring that’s missing its back. Use painter’s tape to hold your decoration in place until the glue dries. Here’s mine hanging on a silver plated ball chain. 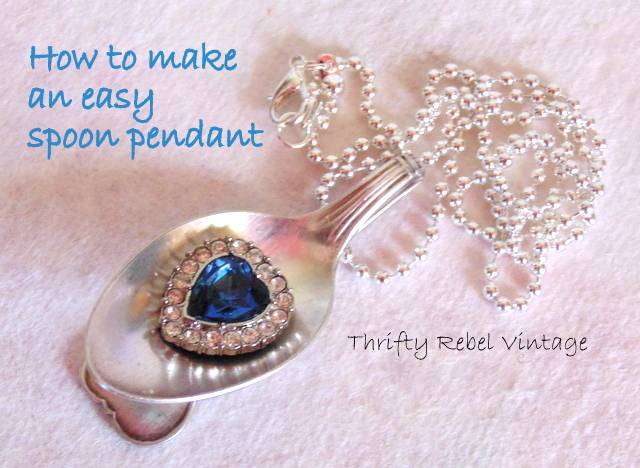 This spoon pendant can be as easy as this one, or a little more challenging… depending on how you want to decorate it. Here it is again with a few others I’ve made. The black and gold beaded earring is glued onto a flattened teaspoon, and the one beside it was made using a butter knife and pieces of a rhinestone necklace. The two pink flowers pieces that you see are parts of a broken bracelet, and the faux pearl beaded pendant is another vintage earring. Here are all the backs. This would be a fun project at a girl’s birthday party. I loved making jewelry out of odds and ends when I was a girl… and I still do. 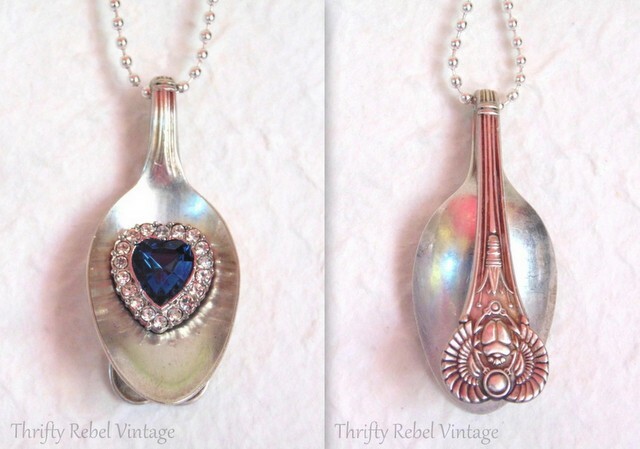 This spoon pendant can be easily customized to anyone’s style, and it’s a great way to use up all those odd pieces of vintage bling… especially single earrings that are just too pretty to throw away. 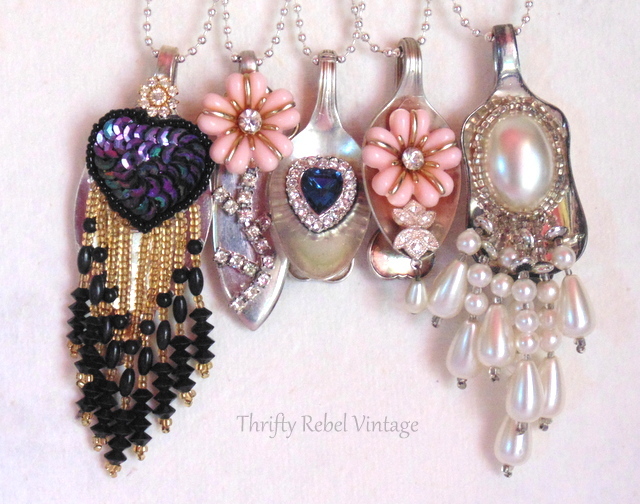 For another easy pendant project check out my Decoupaged Chandelier Crystal Pendant. NOTE: For those of you who may follow me through Blogger I’m still here, but I moved to WordPress. My new blog is at thriftyrebelvintage.com. You can follow me by email, or by using the social media buttons below my signature. Totally Amazed and what a stunning piece of jewelry. 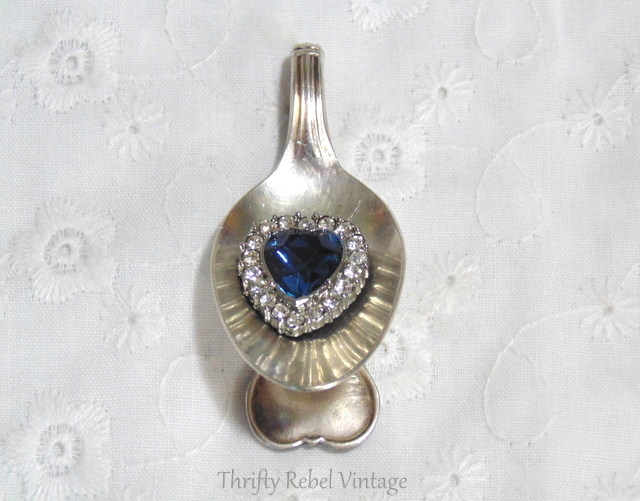 Like how the heart earring co-insides with the heart shape end of the spoon. Such a great idea to do with some family keepsakes jewelry. That’s wonderful Dona! I’m thinking of giving a few as gifts myself this coming Christmas. They can be so easily personalized. Wow! So creative and unique. I love every one of them! Love your easy tutorials. Just made my teacup bird feeder and it was SO easy! Tuula, you've done it again, you've created a unique and stunning piece of art 🙂 I am in love with these pendants! They are quite lovely, my friend. Happy Monday! hugs! These are so adorable Tuula. You are so creative!! Awesome idea Tuula. I’ve been looking for silver and silver plate flatware for quite a while…. Unfortunately, I think everyone else in my area is too….lol I’m keeping my fingers crossed that I’ll find my silver stash some day…. Thanks Patricia! I’ve heard from others who have that same difficulty finding silver plate cutlery. In my area it’s really not a problem at all. I hope you find some soon. Oh how cute! It reminds me of when my kids were little and one turned a baby spoon into a sweet Christmas tree ornament I still love putting up. Thanks for another sweet idea via The Enchanting Rose. Thanks Kaye! What a lovely keepsake you have to put on the Christmas tree every year. 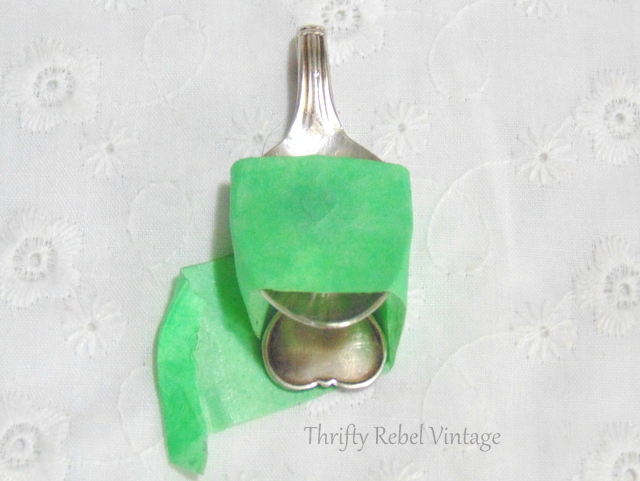 Spoons can really be repurposed in so many ways. I love your necklaces. I have a bunch of old spoons too but I thought I needed to cut them to make necklaces. Thanks for showing me that that’s not necessary! Have a great weekend. Thanks Virginia! That’s what I always thought too, but I didn’t want to go through all that trouble. This way is so quick and easy… and fun too. Those are too cool, you did a beautiful job with these!! Thanks so much Connie! I appreciate your stopping by and commenting. Hello Tulla~I just had to come for a visit from my dear Stephanie’s party, and take a closer look at the beauty created by your hands, lovely, just lovely. These would be beautiful just having around the home, so as to look and appreciate the beauty. You do lovely work, and thank you for sharing it with us. It’s so nice tho meet and visit with you. It’s very nice to meet you too Debbie. Thanks so much for your lovely comment. You have made my day. Take care, and have a lovely week. 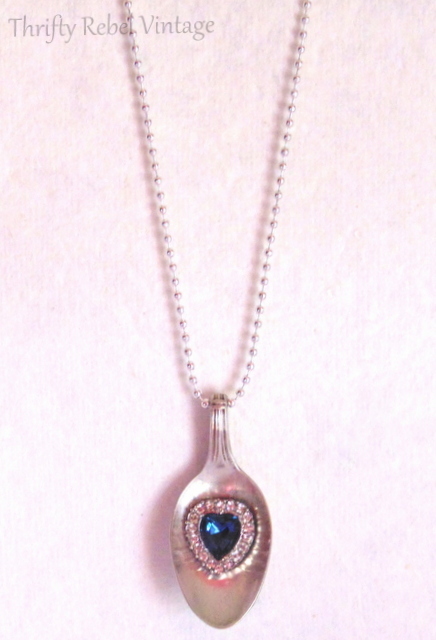 Hi Tuula, I have made a spoon pendant and wear it often. Mine is a little different. The handle is cut off. I like yours also! Thanks for sharing with SYC. Thanks Jann! I’ve made those pendants before too. They are very pretty, but I wanted to make a much easier version that didn’t require any tools. Anyone can make these. Great idea to recycle spoons! I’m heading for the thrift shops tomorrow. Way back in the sixties I found an antique silver spoon with my sign on it and had it made into a ring that I wore constantly for many years. I’ve also had a lifelong fascination with ancient Egypt. I don’t suppose you have any of those spoons with the scarab beetle (like you used in the demo) available for purchase? I’d love to have one for a ring. Looking forward to your newsletter, too! Thanks so much for your comment Siva. I’m sorry, but those are the only two of those spoons that I had. 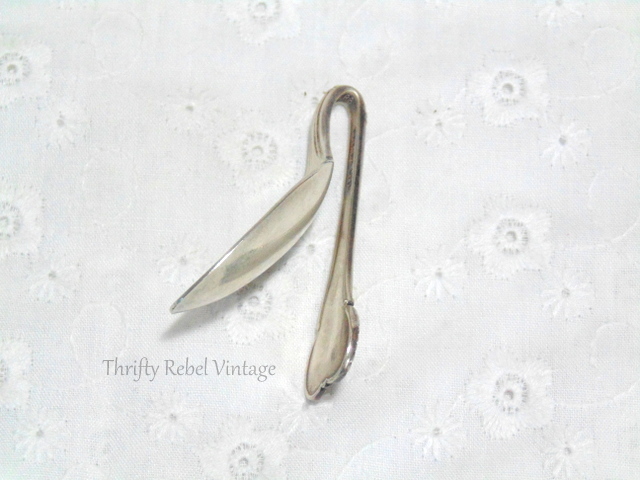 When I find spoons they are often in mismatched bunches. You are right though. That spoon would look great as a ring. Perfect! You have all the supplies you need. If you make some I’d love to see what you came up with. I’m so glad you were inspired by my project. Thanks so much for stopping by and letting me know. 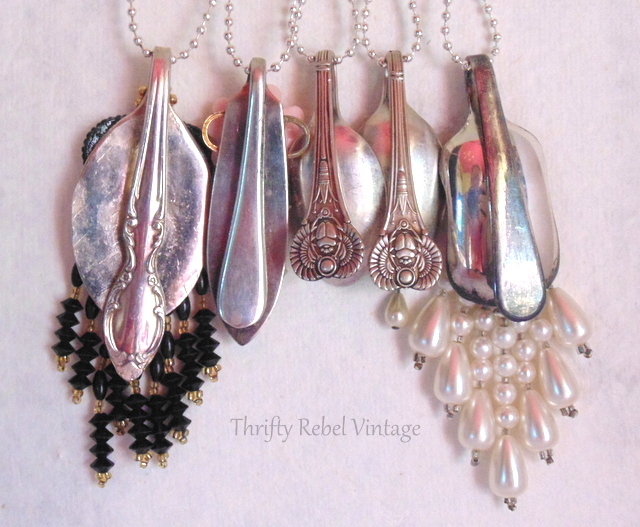 I have a collection of vintage silverware but would have never thought to use one for a necklace. What a fun and creative project. I am visiting today from The Enchanting Rose. Nice to meet you! Nice to meet you too Mindy! These are so quick and easy to put together. Vintage silverware would be perfect. Thanks so much for stopping by. Great idea! Thanks for joining Home Sweet Home! These are so pretty, Tuula. I never thought of keeping the end of the spoon intact, great idea and it shows off the pretty pattern. Thanks for sharing your necklaces at Vintage Inspiration Party. These are so pretty and creative. It would be a lot of fun to make a bunch of these as a group craft, little and big girls alike, LOL. Hi Tuula, I have spent hours visiting your site and I’m still not finished but I already have a list of items I need for different things I want to make! I think this might become addictive, thank you so much for all the inspiration! Wow! Thanks so much for visiting Pam. I’m thrilled that you’ve found so much inspiration on my site, and that you’re going to make some of my projects. Nothing makes me happier, and I appreciate you letting me know. Oh my oh my oh my girl you’ve out done yourself with these spoon pendants. My mind is ?BLOWN ?Away. I have spoons I have mis-matched jewelry oh my. I can hardly wait to get started. I so needed a ?Lite under me. I was at a creative funk with all my junk. Thank you so much for sharing your mind.